Oneroa Waterfront is a luxurious, architecturally designed holiday home and an extraordinary treasure for those who want their own slice of paradise by the beach in Oneroa. Nestled along the Oneroa ridgeline with direct beach access that greets the white sandy beach, this stunning holiday home has a gorgeous interior that effortlessly connects with the outdoors. The attention to detail will inspire you to lie back, relax and enjoy the beautiful surroundings and magical views. 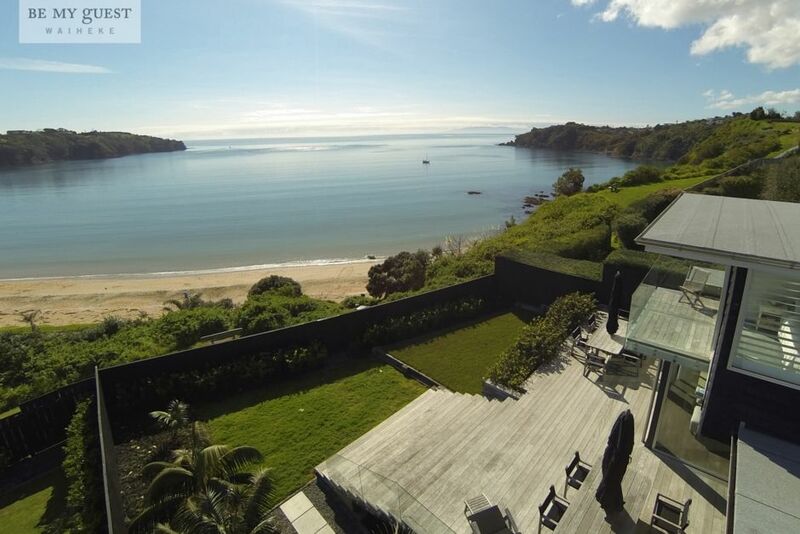 The main living areas open out onto large north facing decks overlooking Oneroa Beach. With multiple outdoor dining options, hot outdoor shower (to rinse off after the beach) a double internal access garage, boat pad, wireless Internet, DVD and stereo system, this is one holiday house in which your usual conveniences are well provided for. Gather your swimming gear and head to the beach. Spend the days lazing with the family on the sand, fishing on the rocks or simply relaxing in complete style at the house. Your booking includes all quality linen and exit cleaning so you have nothing to do but relax, refresh and enjoy. Situated just above Oneroa beach, and a very short walk to Oneroa Village, this is the perfect location. Add to that the fact that this property is beautifully designed with gorgeous interiors and has superb views, you will not want for anything in this property! Great place, great view. Close to town and close to the beach. An absolute gem! A beautifully appointed property with spectacular views, and only a short stroll to all the best that Oneroa has to offer. Excellent convenient location with great views. Located above Oneroa Beach, with the village just down the road, this is the perfect location. Oneroa Village is the main township on the island, with great cafes, and boutique shops. A few minutes drive away are Cable Bay & Mudbrick wineries. Exploring further along the coast are multiple fabulous beaches, great wineries, cafes, award winning restaurants and a golf course, all within 10 minutes drive.